!No Al Bosque Industrial! 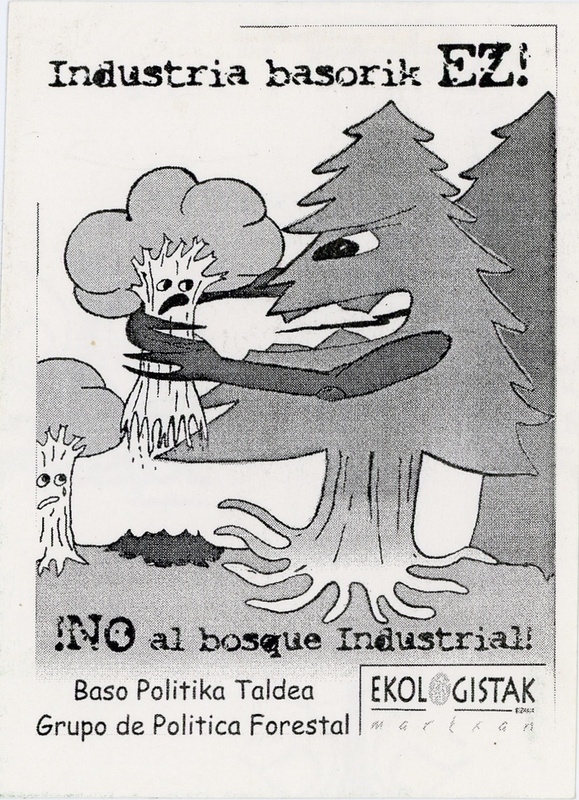 Baso Politika Taldea -- Grupo De Politica Forestal -- Ekologistak Martxan. Say No To The Logging Industry -- Forest Policy Group -- Ecologists In Action. The sticker shows in black and white a giant pine tree with his arms (branches) reached out grabbing a smaller tree who appears scared. In the background there is another small tree looking up in terror and crying. The text on the sticker advocates for an end to an "industrial forest" or in other words the logging industry. The sticker was produced by Ecologists in Action, an environmental group that is based in their understanding that environmental problems are rooted in the capitalist model of production and consumption. In our increasingly global world this capitalist model is taking an even bigger toll on our society, and the degredation is becoming an urgent problem. Ecologists in Action is raising awareness and taking action to help resolve the environmental crisis we are entering.